Will Nick Ritchie Rebound in Anaheim This Season? Will Ritchie Rebound in Anaheim? During the 2014-15 NHL season, Nick Ritchie saw his first significant playing time with the Anaheim Ducks. He played in 33 NHL games, recording four total points — two goals and two assists. Ritchie didn’t play poorly in Anaheim, but his numbers were a significant drop off as opposed to when he played with the San Diego Gulls. In 38 AHL games last season, he scored 16 goals and recorded 14 assists. He averaged just under one point per game. He was tied for third with the most goals scored behind Michael Sgarbossa (17) and Chris Mueller (20). Ritchie was also tied for the team lead in power-play goals with eight. It’s not uncommon for a player to do well at the AHL level, but then needing time for that play to translate over to the NHL level. However, with Ritchie, the expectations have been set high as he was drafted in the first round of the 2014 NHL level draft (10th overall) by Anaheim. One would think he will rebound this season at the NHL level because the opportunity is currently present on the Anaheim roster. The Ducks lost several forwards in the offseason, giving Ritchie a solid opportunity to play even more this season in Anaheim. The Ducks saw the departure of Shawn Horcoff, Brandon Pirri, Jamie McGinn, David Perron, and Chris Stewart this summer. Additionally, Anaheim lost Nate Thompson for several months due to a torn Achilles tendon. General manager Bob Murray did bring in some forwards, including Jared Boll, Mason Raymond, and Antoine Vermette. Murray still hasn’t acquired the scoring left-winger he was looking for at the beginning of summer, which leaves the door wide open for Ritchie to step in. Last season, he played on several lines but never seemed to find the right fit with his linemates. This season coach Randy Carlyle could play Ritchie on several different lines. If Carlyle keeps the Ryan Kesler line together (which consists of Kesler, Andrew Cogliano, and Jakob Silverberg), then there are a few options where Ritchie could play. 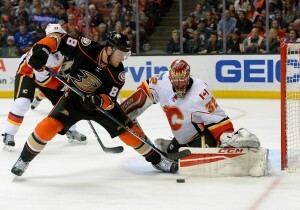 First, Carlyle could try playing him with Ryan Getzlaf and Corey Perry. With Perry and Ritchie both crashing the net, this line could create problems for opposing goaltenders in front of the net. Getzlaf would be able to pass to either forward, which may help spark Ritchie’s offensive numbers. Another, and probably more interesting line combination, would be Ritchie with Rickard Rakell and Mason Raymond. Rakell has yet to be re-signed with Anaheim, but assuming he returns, then this line combination could be effective offensively. Rakell has good speed and his playmaking ability has really shined since moving to the center position. Raymond also brings speed to his game and has an opportunity to score 15 goals this season. The speed of this line alone may help Ritchie produce more goals this coming season. There could still be other line combinations for Ritchie because the Anaheim lineup is not set right now. With a new coach, new players, and likely a new offensive system in place, the Ducks roster will be in flux for the preseason and likely beginning of the season. It is exciting to think what the Anaheim lineup could look like, but it is also nerve-racking to think about with the high turnover of forwards in the offseason. Can Ritchie Be Successful Next Season? For Ritchie to be successful in Anaheim this coming season, he needs to find chemistry with his linemates. He also needs to continue going to the net and maintain his offensive forechecking gameplay. If he can do that each shift, then he has a solid chance to score 15-20 goals this season with the Ducks. He has the size and the talent, he just needs to keep working hard and good things will follow. Most of his success next season will depend on his own work ethic. If Ritchie fails to find a groove with his linemates, then it may be wishful thinking to see him score between 5-10 goals this year. When he doesn’t play aggressively in front of the net, then he isn’t playing at his best. If he can’t keep his gameplay up every shift, then he will likely be sent back to San Diego. Anaheim still has other options in San Diego if Ritchie doesn’t meet expectations again this season. Newly acquired Corey Tropp also had 16 goals in the AHL last season. Nic Kerdiles had 15 goals last season and Stefan Noesen had 10 goals. It’s uncertain how Ritchie will perform this season in Anaheim. For now, unless Anaheim acquires a scoring left wing, he will have the opportunity to step up and become a mainstay in the Ducks lineup.